A bronze figure of bodhisattva Samantabhadra, seated in ‘royal ease’ (rajalilasana) on an elephant, which in turn reclines on a lotus base. The deity is dressed in layered long robes with graceful folds draped around the knees. The right arm is half-raised and the hand expresses the karana mudra, whilst the left arm is lowered in front of his waist, with palm facing upwards. An elaborate necklace with swags and pendants encircles his neck. His hair is neatly tied into a high chignon, while a pointed crown adorns his head. The elegant face has a serene, half smiling expression and is flanked by elongated earlobes, adorned with ear pendants. Two long lotus stems extending from the hands are flanked on each side of the shoulders, respectively topped with a ruyi on his right and a scroll on the left. The crouching elephant has its head turned slightly towards the left, its trunk holds a lotus bud and is curled between six tusks. The elephant wears a howdah and is richly attired with caparisons composed of ‘jewelled’ straps and tassels. The bronze is of even, dark brown colour. Samantabhadra, known as Puxian in Chinese, is regarded as the Bodhisattva of Universal Virtue in Mahayana Buddhism – in Sanskrit, samanta means ‘universally extending’ and bhadra ‘great virtue’. Usually presented seated on a white elephant with six tusks, he is the patron of the Lotus Sutra and made the ten great vows which are the basis of a bodhisattva. The six tusks of the elephant represent the six senses that need to be overcome, as well as the six perfections or paramita of correct behaviour: charity, morality, patience, energy, meditation, and wisdom. A closely comparable bronze figure of Samantabhadra seated on an elephant, slightly smaller in size and dated to the 16th – 17th century, is in the collection of the British Museum. 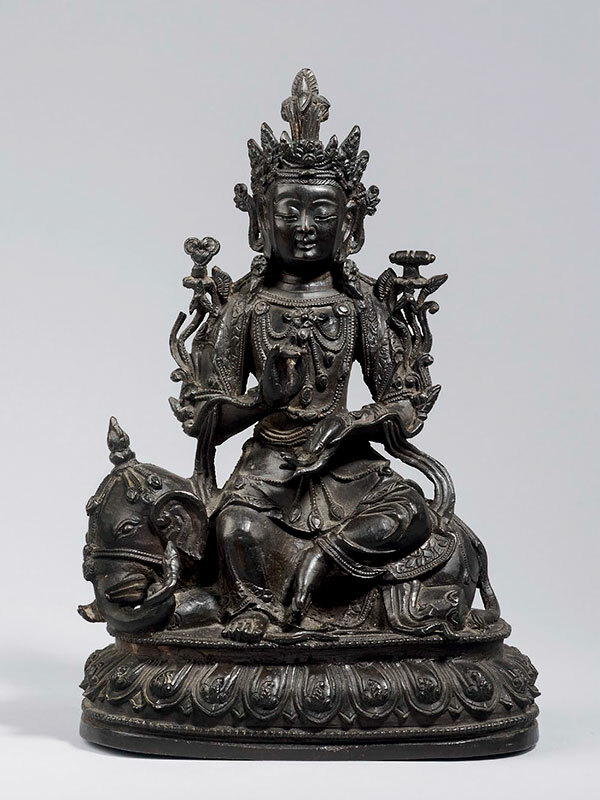 Another comparable bronze Samantabhadra, dated to the late Ming to Qing dynasty (17th – 18th century), is illustrated in The Second Bronze Age – Later Chinese Metalwork.